Pictures can move our hearts and minds to a place far away from this one. Sometimes it’s too easy to avoid. Before visiting Damyang, I recall A friend who gave some pointers. People usually think of the bamboo forest but he quickly pointed out that the Damyang Metasequoia Road should be our first stop, and that a walk-through took him back to California. He spoke of beautiful redwoods and. I’d never been to the American West outside of an airport stop or two. As we approached Damyang, our anticipation at seeing those leaves was impossible to keep down. In Korea, that time when the leaves start their inevitable turn transforms each weekend into a mad dash to spot the foliage before the coming winter. Seeing the Metasequoia Road would be even more special than usual maples, and I’m so happy we made a stop in Damyang for them. Damyang also appeared in our feature on Spring Things to Do in South Korea. From Seoul’s Central City Bus Terminal, an express bus will get you to the Damyang Bus Terminal in about 3 hours 45 minutes. Travel time might jump up if you’re traveling during a busy or holiday weekend. From the Damyang Terminal, take Bus 10-1 and get off at the Gipeunsil (깊은실) bus Stop. Depending on traffic, travel time will take at least 15 minutes. 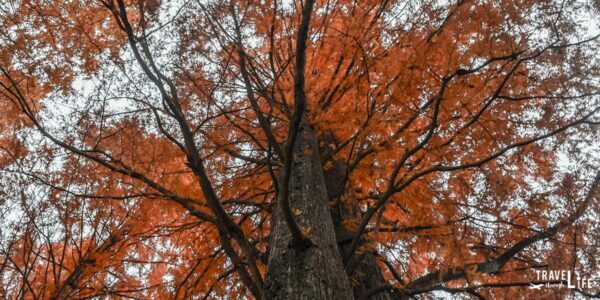 From the bus stop, the Damyang Metasequoia Road is a short walk and easy to find when the colors are changing in the fall. This day starts off with enough sunlight that will hopefully hold throughout the rest of our visit to Damyang. Arriving early is always a smart move on the weekends and a perfect way to avoid crowds. Traffic starts picking up even as clouds take over the surrounding skies. The season’s unpredictability is winning out again but we park near the bamboo forest and pick up some bikes for a ride. We casually cycle along paths that cut through the Slow City and head towards around the Damyang Metasequoia Road. The path runs parallel to them and even from across the busy road, I imagine that it will be an awesome scene when we walk through. First, we return the bikes and check out Damyang’s most famous attraction. A walk through the bamboo forest leaves me thinking back to that talk a few days before and the redwoods. I love the green surroundings that the bamboo provides but the crowds turn me off. Here we’ve come after battling the ever-worsening traffic to overcome hordes of people that are throwing trash and spitting all over the place. This isn’t my scene, I think, as we head out and move to the Metasequoia Road. Seeing the trees lined up together and this time from the angle where they’re surrounding me, a song suddenly starts up from within. A monk is standing just inside the entrance and playing an acoustic guitar. He’s jamming out to some 1970s folk songs reminiscent of James Taylor, though I can’t place the artist he’s covering. He greets us with a big smile before going into the chorus of that unknown tune. Walking around the orange-shaded ground, hordes of families and friends surround these beautiful trees. It’s crowded but with the mix of music and colors all around, I’m in love with this scene. Everyone here gets it and is standing here for one last chance to see some beauty. Walking on the road and losing our place through these beautiful colors, we turn back and hope to get another listen to the monk playing some of my parents’ generation’s best tunes. Maybe I can ask him to name some of the songs and jog my feeble memory. However this time there’s no music. His set has long since finished and the monk has left the building. I still wish I knew the songs he was playing just a few minutes ago. I could almost sing along with him and am kicking myself for the names. Regardless, I’ll never forget that moment when we first saw him playing and smiling at the entrance. His bright face and beautiful songs along with those beautiful trees will always be there. Nobody can take that away, even if I can’t remember the names of his songs. Those mental photographs and sounds will never leave, even if they grow fuzzy and less decipherable over time. I’ll always hear and see him playing as I’m approaching Damyang’s beautiful Metasequoia Road. Isn’t music a wonderful thing? It’s something that I will use as a connection between the present and past. If I ever hear that song again, I’ll instantly remember the monk playing away at the Damyang Metasequoia Road. Then I’ll find a way to get the name. It won’t escape me next time! Ever Had a Moment Like This? I’d Love to Read Your Story in the comments section below! This travel guide is part of our series on South Korea Travel and East Asia Travel. It was originally created on December 5, 2014. It has been maintained and updated (as of December 28, 2018) to reflect current viewpoints and travel trends. We really gotta get down to Damyang this year before we leave Korea again…I’ve always wanted to go!!! Beautiful photos! The Damyang bamboo forest is cool but loses out to the metasequoias. It’s pretty awesome in that place, I have to say. Get some ddeokgalbi there too, if you can! Not sure where you stand on meat so apologies if that’s not your thing. Thanks for stopping by and commenting. Safe travels, you two! I saw these trees when I drove to Damyang in September but they were still green. What I would do to go back now! I’d love to see them in Autumn. Thanks Rafiqua! I feel like we visited at the perfect time. Would love to go back and see those gorgeous colors again. This is wonderful! You are an amazing writer and I hope you never stop! Really beautiful trees..I love love trees and these are just amazing to look at. Autumn flies past too fast though. It’s already winter in Korea. Thank you Sha! Fall was like nothing, I feel. It came and went before I finished my sentence about it. It was so beautiful though, when it was here. I hope you’re doing well these days! This place is breathtaking! One of my adult students told me about this place, but I never made it there. Now I see why she was so impressed with it. Thank you Nathan! I really appreciate that. It’s too bad you didn’t get over to Damyang. It’s actually a cool little town and is more than the Bamboo people talk about.